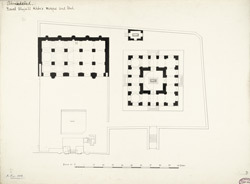 Plan of Nawab Shujat Khan's Mosque and tomb at Ahmadabad in Gujarat.There is an inscription on the qibla wall that gives the date 1695. The facade has five pointed arches leading into five bays divided by piers. There are two slender octagonal minarets and three bulbous domes. The walls and piers have a marble dado with white plaster above. The tomb or maqbara of Shuja'at Khan is located north of the mosque and is set in an enclosure. The enclosure contains seperate rooms around an open court which were used as a school or rest-house.